Colorado lawmakers OK'd new oil and gas regulations. What's next? The immediate impact of Colorado's oil and gas reform package is already being felt, and Governor Polis hasn't even signed the bill into law yet. 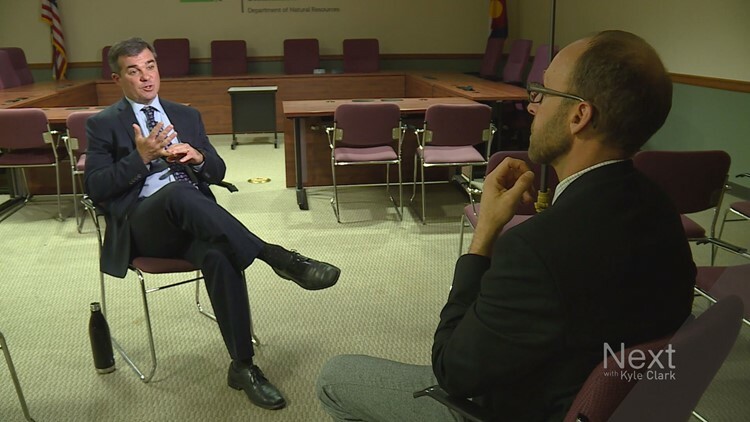 DENVER — The immediate impact of the oil and gas reform package passed by the legislature is already being felt and the governor hasn't even signed the bill into law yet. In his first interview, Robbins told Next with Kyle Clark that the new legislation does not give him wide authority to shut down oil and gas drilling operations. "There is not a directive to allow that authority to, statewide, issue 'no permits are going to happen,' instead it's an objective look site by site, whether a well deserves a little more analysis, given the new legislative mandate that we now have," said Robbins. The bill makes several changes to how oil and gas operations will work moving forward in Colorado. The Colorado Oil and Gas Conservation Commission will go from a nine-person volunteer board to a seven-member full-time board. Five of those seven members will be appointed by the governor, with one being someone from the oil and gas industry (down from three) and one with a specialty in public health. The full-time board won't be effective until next year, however, the makeup of the commission needs to change upon the governor's signature. That means fewer oil and gas industry representatives and that one public health expert need to be in place before the next commission hearing. The commission and the commission's new director will be charged with making decisions with an emphasis on public health and safety. The commission reviews the permits that are the initial steps an oil and gas operator must take to start a new drilling operation. They review drilling and spacing -- essentially the area underground that will be drilled. The director reviews and approves the permits to drill and the location for the wells. As of March 1, there were more than 6,400 well permits waiting for approval, and permits for more than 500 sites where those wells would be located. "I meet twice weekly with my staff and we go over oil and gas wells that require a little more thorough review and we'll just continue to do that. We're going to possibly change the criteria and we're going to have stakeholder input into what the criteria is, including input from the industry. Once we get that all set up, we'll continue business as usual in terms of how we are processing oil and gas wells," said Robbins. He said the delay of the commission hearing isn't a ban because he still has authority to be approving the backlog of permits for drilling and citing. "That's one of the reasons that the legislature created this director discretion, is that we needed to figure out what do we do with backlog, and again, it was unacceptable that all those wells get a free pass because it means that legislation would basically be ineffective for five, six, 10 years, on the other hand, we don't want to hold all those wells up. We want to let oil and gas continue to thrive in Colorado," said Robbins.